Gem, is a wife and mum living in Western Australia. She holds a Bachelor of Education in Primary teaching and is a music specialist in a primary school as well as running her own business teaching music to bubs, toddlers and their grown ups. She enjoys writing and blogging somewhere in the spaces between. 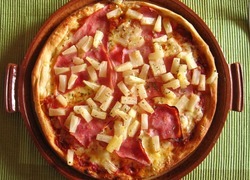 Should pineapple be a pizza ingredient?